What are vertical coordinate systems? A vertical coordinate system defines the origin for height or depth values. Like a horizontal coordinate system, most of the information in a vertical coordinate system is not needed unless you want to display or combine a dataset with other data that uses a different vertical coordinate system. Perhaps the most important part of a vertical coordinate system is its unit of measure. The unit of measure is always linear (for example, international feet or meters). Another important part is whether the z-values represent heights (elevations) or depths. For each type, the z-axis direction is positive "up" or "down," respectively. In the figure below, there are two vertical coordinate systems: mean sea level and mean low water. 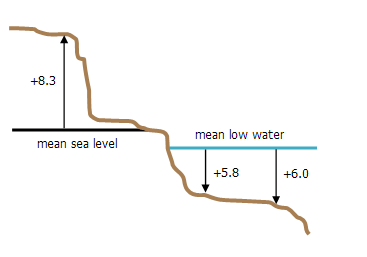 Mean sea level is used as the zero level for height values. Mean low water is a depth-based vertical coordinate system. Height-based and depth-based vertical coordinate systems. One z-value is shown for the height-based mean sea level system. Any point that falls below the mean sea level line but is referenced to it will have a negative z-value. The mean low water system has two z-values associated with it. Because the mean low water system is depthbased, the z-values are positive. Any point that falls above the mean low water line but is referenced to it will have a negative z-value. The geographic_coordinate_systems.pdffile in the ArcGIS Documentation folder contains a list of the supported vertical coordinate systems.